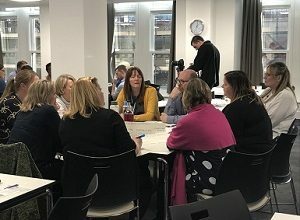 In collaboration with NHS England’s Nursing Directorate, the Yorkshire & Humber AHSN hosted an event for community nurses and commercial organisations, focused on exploring the changing landscape and challenges faced by community nurses in completing their day-day duties. The event was attended by over 85 delegates from across the country, including representatives from community nursing teams, NHS England and commercial providers of solutions to name but a few. Several high-profile speakers including Dr Crystal Oldman CBE, CEO of the Queen’s Nursing Institute and Emma Self, Community Nursing Lead for NHS England, opened the event and outlined the background and scale of the challenge. The event heard from several areas across the country who have successfully implemented technology to support their community nursing teams, and a panel chaired by Heather Caudle, NHS England’s Director of Nursing – Improvement, debated the challenges, risks, opportunities and success of implementing technology within community nursing teams. Several companies discussed their innovative products which can help support community nursing teams, and finally, an interactive workshop session consolidated learning and discussions from throughout the day focusing on how technology may be implemented within local areas. Sean Clarkson, Programme Manager at the AHSN said: ”This event was designed to explore how digital technology can help community nursing teams in their day to day duties for the benefit of both staff and patients. We had a wide variety of stakeholders attend the event, including NHS England representatives, community nursing teams and solution providers.